Dinner Under the Stars & Simchat Torah! The ever popular Dinner Under the Stars will, G-d willing, once again be held on the first night of Sukkot, Sunday evening, September 27th! Reservations are already open at www.jbayarea.org/rsvp (the suggested cover is $25 adult, $12 child, sponsorships welcome). This joyous, fun and delicious Simchat Torah celebration will, G-d willing, be held at our new center on Monday evening, October 5! Save the date, because Simchat Torah at Chabad is something you just don't want to miss! Pre-High Holiday Class - this Tuesday! Join us for an interactive pre-High Holiday class as we peel away the layers to discover the reasons and deeper meaning behind Jewish holidays and observances, and how they are illuminated by the light of Kabbalah and Jewish mysticism. Watch your mailbox: Holiday Guide! Watch your mailbox for our beautiful High Holiday Guide. 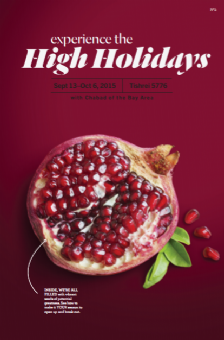 The guide features helpful information about the ins and outs of every holiday throughout the month of Tishrei, as well as a full listing of the Chabad Bay Area holiday events. Check it out and RSVP online at www.jbayarea.org. New center in the works! We are pleased to announce that we have signed a lease on our first public center to serve the community and to be home to our many outreach activities and programs in the Bay Area. The Chabad Bay Area - Center for Jewish Life and Learning, located on W. Main St in League City (just west of the I-45), will, G-d Willing, serve as the go to place for our offering of adult education classes, holiday celebrations, children's programs, services and more. The process of renovating it has already begun and, with G-d's help, we aim to have it all ready in time for the High Holidays. This big step forward is only made possible by grass-roots community support. We invite you to join in and take part in helping to make this historic step a reality. Whether you might consider a modest monthly donation to help cover some of the rent, or joining in with family and friends to sponsor a feature or room in the center, no amount is too large or too small and of course, most sincerely appreciated! 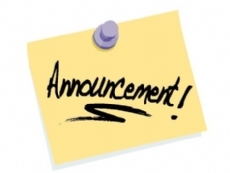 Please stay tuned for updates. We look forward to welcoming you this fall at the new location!